Swing is the hottest dance craze sweeping the country! Learn how to dance east coast swing, west coast swing, triple swing, Lindy, jitterbug or jive. More swing videos on swing 2. Put on your poodle skirt and roll up your jeans because swing is back and so are the dances of the 50's! This video includes the national versions based on a nationwide survey of the most popular dances of the 50's and 60's. Learn the East Coast Swing, Stroll, Hand Jive, Bunny Hop and more. Then look "far-out" and "cool" in your bell bottoms doing the dances of the 60's including the Twist, Jerk, Monkey, Pony, Swim, Mashed Potatoes, Skate, Shimmy and more! This three camera video was shot with the instructors back to the camera so the viewer can get the best view for learning the dances. These dances are fun to do whether you are a kid or an adult. With all the recent interest in the oldies, you can't miss out learning these dances for your next party! Two-time “Dancing with the Stars” champion Julianne Hough is ready to share her best-kept secrets and techniques for getting a lean, toned dancer’s physique! Known for her standout choreography, contagious enthusiasm, and ability to teach anyone to dance, Julianne will motivate you to dance the Cha Cha, Jive and Paso Doble with her in this fun and effective workout—no partner needed! These fat burning moves are carefully choreographed to keep your heart rate up and help you dance your way into fabulous shape. Bonus: One-on-one personal dance lesson with Julianne! This is your chance to learn from the best! In this bonus feature Julianne will break down key steps at a slower pace and refine those little details that will make your dance “ballroom beautiful!” Take this personal dance lesson before your first workout to make your dance flow smoother, or do it any time you want some extra fine-tuning for your steps. DVD Features: Cardio Ballroom Workout, Personal Dance Lesson with Julianne, and Behind-The-Scenes Interview. Each season, audiences watch in amazement as stars shrink down and shape up on ABC’s Dancing with the Stars. Now you can share their weight-loss success and dance off the pounds with three different cardio dance routines—Swing, Jive and Quickstep—led by pro dancers Dmitry, Lacey and Kym. Each routine gets your body warmed up with the signature moves of the featured dances before progressively adding on to create complete, calorie-blasting workouts – so you can learn with ease and get dancer fit all at once. Join the fat-burning fun and dance your way to a superstar body! The aim of this DVD is to teach you a series of three stylish Ballroom combinations. Simon and Heidi Cruwys, former UK Professional Ballroom Champions, provide the best, step by step, instructions. Each of these combinations will be taught in three clear stages. Stage 1: Each step within the combination can be practiced individually with detailed instructions. Each step will be repeated slowly three times. Stage 2: The steps will now be practiced together in sequence as they appear in the full combination. The step sequence will be repeated six times. Stage 3: Finally, the whole combination is practiced to music at a realistic pace. The combination will be repeated six times. You'll be the envy of friends and family in no time! Bonus Materials: Bonus routine for the next series; looped practice structure; interactive menus allow you to practice on your own as Leader (Gentleman), Follower (Lady), or as a Couple; and special professional competition jive routine. Dance Lessons 101 is our all-in-one DVD. After extensive planning, we've combined the starting points for Ballroom, Country, Swing and Latin Dancing into one easy-to-understand program. 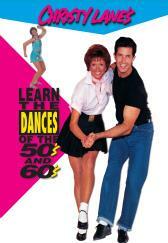 This DVD is proof that you can learn to dance without live instruction - and in a fraction of the time. Master the fundamentals of multiple dances with the Trautman method. You'll be dancing the Slow Dance, Waltz, Swing, Salsa, Two-Step, Cha-Cha, Hustle and West Coast Swing in a matter of minutes. Dance Lessons 101 features nearly two hours of instruction, picture-in-picture technology, HD filming for optimum clarity, and multiple camera angles to ensure that you, the student, get the best view. Each step and move is taught for both the leader and the follower as well as together, allowing you the option of learning with or without a dance partner. Not too interested in the Cha-Cha but can't wait to Hustle? DVD menu selections allow you the option of streamlining your lesson. Owning this DVD is the equivalent of having your own private instruction for a fraction of the cost, and it's ideal whether you're learning to dance at a special event or achieving better fitness. Feel good about your new hobby, and take your skills ever-further by choosing from more than two dozen other titles in Shawn Trautman's Dance Collection. Dancing Success Starts HERE with Dance Lessons 101. We'll see you out on the dance floor! DVD - Region 1 (US, Canada). Swing Dancing for Beginners Volume 2 offers the perfect follow-up of the thorough instruction presented in Swing Dancing for Beginners Volume 1. Anyone who's comfortable with the basics and the understanding of leading and following will find this DVD to be a necessity for rapidly increasing your Swing knowledge. Each volume in the series is professional, easy to follow, designed specifically for beginners and fun for everyone. With nearly 1½ hours of instruction, multiple camera views, and an easy navigational menu, Shawn and Joanna Trautman will build your confidence and have you dancing along with them. The design of the curriculum and camera placement for the DVDs allows the leaders to do the EXACT movements that Shawn presents, and it allows the followers to mimic Joanna in real time without having to turn away from the screen. In addition to learning along with the instructors with split-screen formatting, you'll also get to dance each dance with music alongside the instructors at the end of each section. This beginner DVD covers leadable patterns such as the Ladies Inside Turns, the Guy's Inside Turns, Wraps, Fake Wraps, Behind the Back Hand Changes, Tuck-Turns, Touchbacks, and a number of other fun and easy tips for the leaders and followers that you'll only find in Shawn Trautman's collection. Taught at a slow and steady pace for beginners, this DVD is perfect for gift-giving to friends, family, co-workers, or yourself. This DVD is best used after Swing Dancing for Beginners Volume 1 and before Swing Dancing for Intermediate Dancers Volume 1. 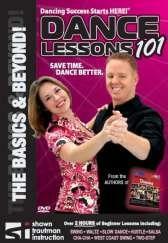 With nearly two decades of experience, a number of World Champion students to their credit, and their recently published book “Picture Yourself Dancing: Step-by-Step Instruction for Ballroom, Latin, Country, and More”, Shawn and Joanna have perfected the basic elements of each dance while specializing in the leading and following aspects which are extremely hard to find. Shawn and Joanna will demonstrate, explain, and teach you more about leading and following the Swing so you can dance anywhere with anyone, rather than just learning a single step that can only be done with your partner. As you've experienced from Volume 1, these DVDs are the equivalent of having your own private instruction at home. If you're looking to add on to everything you learned in Swing Dancing for Beginners Volume 1, then Beginner Volume 2 is the absolute next step for you. Once you've completed the series, you'll want to check out Shawn Trautman's Dance Collection in its entirety where you'll have your choice of more than 20 highly-rated full-length dance instruction DVDs. The cultural effect of the revival of Swing Dancing has been sudden and intense. It is now a common sight at dance clubs across the country to see hep cats in their black and white spectator shoes and zoot suits out on the dance floor swirling and twirling their bobby-socked dance partners. Now you can join in all the excitement and learn to master the techniques of Swing dancing with ballroom dancing champion Teresa Mason. This informative dance class features the basic steps for the five most popular Swing dances including: West Coast Swing, East Coast Swing, Lindy, Jitterbug and Jive. Included are five steps for each dance as well as a styling tip. Your competence and confidence will grow as you progress through each easy-to-understand lesson. Teresa Mason is a professional teacher and performer and is a former national champion competitor. Her teaching is accredited by the Imperial Society. Together with her partner, Lance Estridge, they operate Dance Arts in Houston. Check out this fantastic contemporary Swing band! The same band that plays in the video set, Learn to Swing Dance, this CD offers the greatest Swing Music, ideal for dancing! Songs include: Got My Eyes On You; We're Only In It For The Swing; Abyss; If You Leave Me Baby; Zoots Me Fine; Better Days; Ana Mae; That Smile; This Feeling; Schwing; and Zoot. Get the Learn to Swing Dance Videos and the Zoot CD (items listed above) in this great package deal! Night Club Dancing has become a must for anyone who wants to be an all around dancer. Whether in dance position, like Cha-Cha, Swing, and slow disco, apart, like fast Disco, or by yourself, like Line Dance, confidence is based on your knowledge of the basics on the DVD. Our professionals demonstrate turns, hip action, upper body movement and arm styling in all the popular dances, set to great music. Get started today and go out Night Club dancing tonight! More swing videos and DVD on swing 2. Recommend this Swing Dance page to a friend.